Founder Blake Mycoskie fits a Navajo youth for TOMS Shoes. 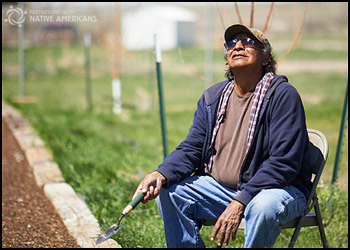 Throughout history, Native American communities have experienced one-sided treatment in the provision of supplies — there is little, if any, connection between needs identified by tribal communities and goods delivered or dumped on reservations. PWNA is committed to providing high quality, useful products that reservation partners specifically request to enhance their programs or meet pressing needs in their communities. TOMS selected Partnership with Native Americans (PWNA) as their first domestic Giving Partner to address need and advance health and education in underserved communities and we look forward to continuing this partnership. Annually, TOMS makes significant gift-in-kind donations that put shoes and winter boots on the feet of Native American youth, often in conjunction with PWNA-supported back-to-school events and school supply distributions. 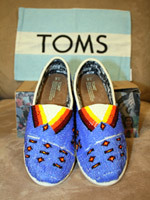 such as these with Native American beadwork. At one shoe distribution in 2014, PWNA collaborated with the Johns Hopkins Center for American Indian Health (JHU), a long-time partner on the Navajo Reservation in Chinle, Arizona. Working together, staff from JHU and PWNA, along with community volunteers, fitted students in grades 1-12 for new shoes from TOMS. JHU also sponsored fitness games and health education to promote public health services available to parents. JHU’s Lorenda Samuel says, “Providing new shoes to the youth brings them good self-esteem and encourages them to keep active, healthy and advancing themselves to a better future and education.” Thanks to TOMS, more than 110 programs on 26 reservations distributed new shoes and boots to Native American students in 2014. As a consistent, reliable resource, PWNA lifts up the efforts of Native people to provide hope and support for their success. PWNA’s distribution network includes more than 1,000 reservation partners and their community volunteers, plus a gift-in-kind network and a distribution system that transports aid to 60 reservations most organizations cannot reach. PWNA travels nearly 300,000 miles annually to serve these remote locations.